Q. How can I view my statement in the International Student Finance Portal? You will start by logging into the Student Finance Portal. Click the "Menu" icon on the top left. Click "Quick Links" and select "My Finances"
Click "Manage Your Account/Make A Payment". You now will see your Student Finance Portal Homepage. Click the "Transaction History" tab. How can I view my account overview? 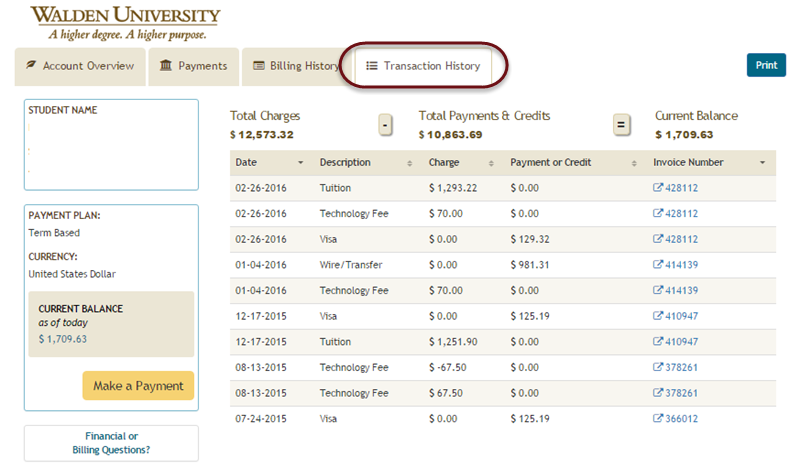 What currencies does Walden University accept? For more information on this topic, please contact Customer Care at financialspecialistINTL@waldenu.edu.